The humid summer weather makes my skin look as greasy as the Jeddawi favourite fried chicken-Al-Baik. The excess oil clogs up my pores and lo and behold we have an ugly break-out right before the Eid/weddings/party *insert public occasion of choice* and not only that it often leaves behind ghastly annoying scars- which have to be camouflaged by makeup under the artful (mis)direction of famous makeup artists. This summer I was looking for a face wash suitable for my combination acne-prone sensitive skin- to avoid the above described scenario, no easy task I tell you. Therefore, I was very pleased when *I was received these Neutrogena face washes to try out* previously I had tried and fallen in love with Neutrogena’s Oil Free Facial Wipes and Lip Balm so I was excited to give these new products a go. Neutrogena’s face washes from the their Visibly Clear range ideal of you are have blemish prone oily/combination skin type. Dry skin types that tend to get oily in the humid summer months will also find this product useful. I always like to use the products for a reasonable amount of time before posting a review. In this case I used the facial washes in the hot and humid summer months (August and September) and so with further ado on to the reviews. First up is the Neutrogena Visibly Clear Pore and Shine Daily Scrub, which won the Cosmopolitan Award for best facial scrub in 2013! 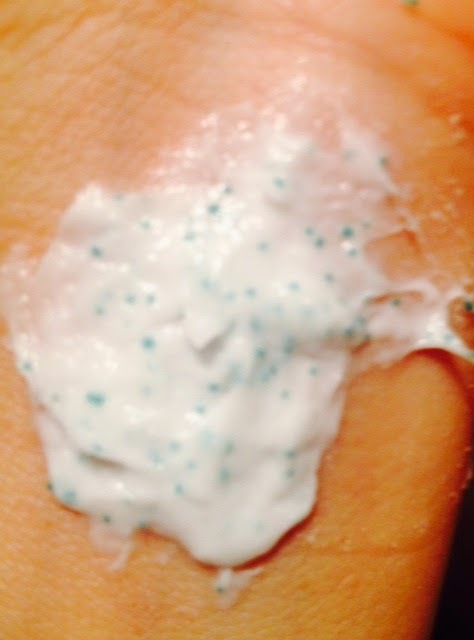 I have sensitive skin and this scrub can be used daily without irritating the skin or causing breakouts, or over drying, it is very gentle and the micro beads feel great on your skin. Has bright energising scent of lime and tangerine- very uplifting to wash your face in the morning. I’m in the habit of using something a bit stronger, like St. Ives Apricot Scrub for sensitive skin used a couple of times a week, or a DIY sugar scrub, so after having used it daily for a few weeks, I have to say that it is not my fave. I felt it didn’t clean my skin enough or maybe it was too gentle?! However, I would advise you to try it out as everyone’s skin is different and I know some people love it. If after massaging the scrub onto your face, leave it on for a while while you brush your teeth, then rinse after your finish brushing your teeth- you will find it works extra time and leaves your skin oh so soft!. Although it did not irritate my sensitive skin I felt it was not strong enough of a scrub..might be just me so I have to give it a 3 out of 5. My favourite was the Neutrogena Visibly Clear Pore and Shine Daily Wash, it is a gel wash which you use twice a day. I usually use it in the morning, and then after working out later in the day and I absolutely love it. It is a great dupe for Dermalogica’s anti-bac gel wash and I really feel it deep cleans and mattifies the skin without over-drying it. I noticed a clear difference in my skin, it looked smoother and non-greasy. It also brings any painful under-skin pimples to a head faster and also shrinks them faster. 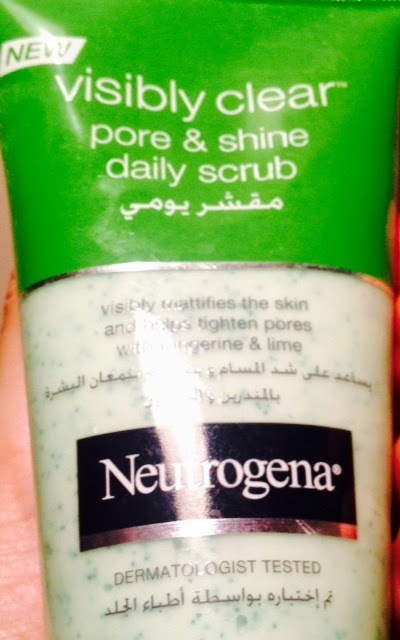 Like the facial scrub it has a zingy citrus fragrance the lime and tangerine perfect to energise you in the morning. Neutrogena Visibly Clear Pore and Shine Daily Wash is also great for cleaning makeup brushes, esp useful for declogging foundation brushes leaving them clean and soft and smelling lovely. I have found that if you use other cleaning products to clean the brush and there is any residue of the cleaning agent left it can irritate your skin. However, the Neutrogena Visibly Clear Pore and Shine Daily Wash is great it causes no problems as it perfectly gentle on your skin. 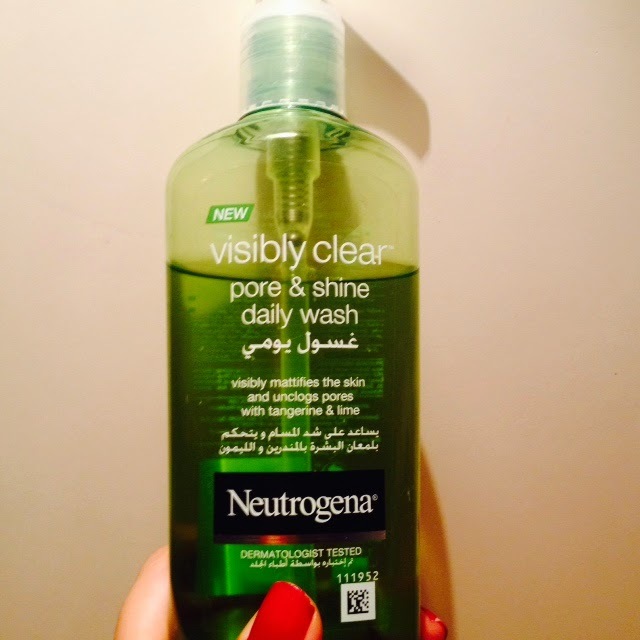 I love products that multi-task therefore Neutrogena’s Visibly Clear Pore and Shine Daily Wash is here to stay as part of my skin-care regimen and I give it 4.5 out of 5. Have you tried any of these products let me know below. keep in touch on Facebook, Instagram and Twitter.